This AMPS Tutorial covers AMPS basics, AMPS frequency spectrum, AMPS system specifications, AMPS frame structure and AMPS call setup procedure. AMPS is the short form of Advanced Mobile Phone Service. This system was developed by AT & T and is regarded as 1G analog system and most commonly used in North America. It supports coverage of about 20 km and data rate of about 10kbps. AMPS spectrum allocated in North America comprised of total 50 MHz, 25 MHz in the downlink and 25 MHz in the Uplink. Downlink refers to Base station(BS) to Mobile station (MS) direction and Uplink refers to Mobile to Base station direction. Downlink RF carrier frequency is 869MHz to 894MHz and Uplink RF carrier frequency is 824MHz to 849MHz. One operator is allocated half of 25MHz (i.e. 12.5MHz band) both in the uplink and downlink. Channel bandwidth is about 30KHz, which gives about 833 total channels in 25MHz span. Hence each operator supports about 416 channels for traffic as well as control functions. 21 channels are dedicated for control signaling channels per operator and the rest is used for traffic purpose. In AMPS, voice traffic is modulated using FM modulation with peak deviation of about 12 KHz. Control channel information is modulated using FSK modulation with peak deviation of about 8 KHz. AMPS uses BCH as forward error correction technique. Supports BCH (48, 36, 5) and BCH (40, 28, 5) flavors. As shown in figure AMPS frame structure is different for forward (BS to MS) and reverse (MS to BS) control channels. There are about 21 each. During connected state, control information carried over normal voice channel used for conversation. Precursor- Total length: 48 bits, composed of sync field(30 bit), word sync field(11bit) and digital color code(7bit). A sync field consists of alternate 1's and 0's. word sync field is fixed pattern of 11100010010. DCC is unique for each Base station and hence help deliver RCC to the correct Base station from MS. Forward control channel has bit sync (10 bts), word sync (11 bits) and two words of data bits. Each word of about 40 bits (including 28 bits of data and 12 redundant bits). For reliability of the frame each word is sent 5 times over the radio link. Call set up procedure is outlined in the figure 2, as shown in the figure call is initiated by dialing telephone number of the called mobile(subscriber #2). The requested mobile (here Subscriber #1) is first authenticated by MTSO (Mobile Telephone Switching Office) and assigned traffic channels for further use. 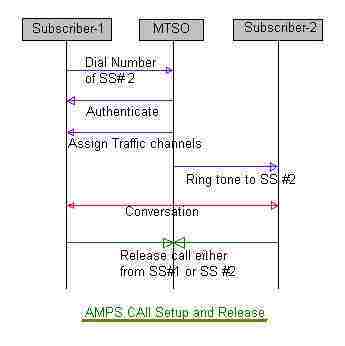 After this MTSO sends ring tone to SS #2 and in turn circuit connection is established between SS #1 and SS #2. The call disconnection can be initiated by either SS #1 or SS #2.